takumi-server (feature-branch) $ git commit -m "Important feature"
However we’ve run into our fair share of niggling little issues, some of which we’ve already solved, some which we are in the process of solving and finally some which we won’t bother trying to solve. The world is changing fast and I believe we’ll be running on top of some container scheduler, maybe ECS, but more likely Kubernetes, before the end of the year. 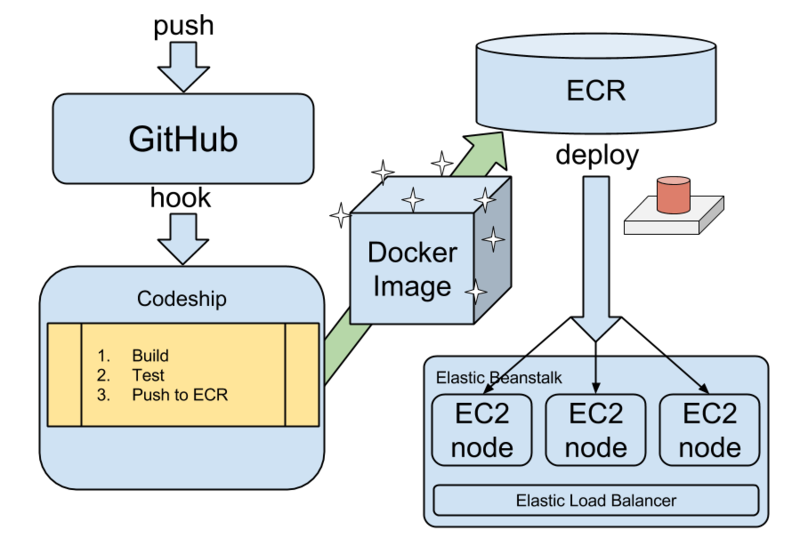 In this blog post I’m going to describe how and why we decided to start deploying pre-built dockers, which we build with Codeship and push to our ECR repositories, and deploy using a tool built around generating Dockerrun.aws.json files based on extremely simple templates. Why deploy dockers, and why pre-build them? In short, building and deploying docker containers allows you to quickly and reliably build an image containing all system dependencies and static configuration which can be tested and then deployed via a registry to multiple app servers. $ docker build -t aws_beanstalk/staging-app . This of course negates one of the major benefits of using dockers: building once, and running anywhere. If you have more than one app server, each one will perform the build steps by themselves, not only wasting resources by doing identical work, but also introducing the possibility for temporal build issues affecting some nodes but not others, resulting in an inconsistent build running on “identical” nodes. In my opinion one of the main reasons to use Docker in production is to build once, run tests on the built artifact, and once deemed safe for deployment that same tested “binary” is rolled out to the different app servers. If your backend is written in C++, Go or Java, you might find this pointless as you’re used to being able to statically link a large binary or release a fully self- contained jar. However in Python, Ruby, and NodeJS things aren’t quite so peachy. Builds are slow, rely on remote and possibly fragile package repositories, which always means builds are slow, and sometimes inconsistent! In our case this pattern of building on each node meant that we were basically overprovisioned rather dramatically to speed up deployments and replacement nodes. Elastic Beanstalk takes care of utilizing local package caches so that subsequent builds get faster as long as there are no major changes in environment or dependencies. Even so we faced harrowing 30+ minute build times when spinning up new nodes, and deploying reasonable changes could take several minutes per machine, and did I mention we were overprovisioned? Between deployments our machines would be 90-99% idle, no joke! So in order to build once and deploy that same tested artifact, what do you need? 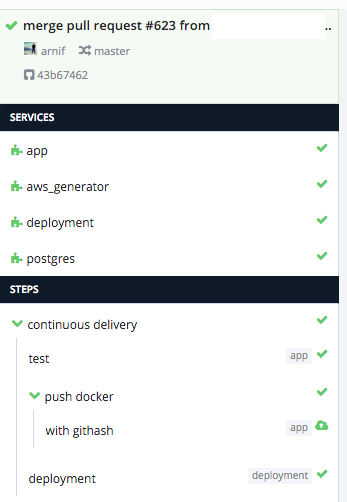 Configure your CI system to build a docker image and run your tests inside the docker, and if you have external integration test scripts to run them against a running container instance of your image. A docker registry or repository to store tagged versions of your images. We decided to use ECR (Elastic Container Registry) because since January 16th they are natively supported by Elastic Beanstalk. We tag all of our builds with the githash (accessible as $CI_COMMIT_ID from within codeship containers). Only push and tag container images which pass tests, appropriately for deployment or use further in your pipeline. We chose not to push any failing containers to ECR. That’s easy using Codeship’s codeship-steps.yml. Finally you need a tool which allows you to reliably tell a particular app environment that it should now run the image that you want. We custom built a little tool which uses git, awsebcli and boto3 to deploy a container with a specific tag, to a specific environment. Deploys the current project to the specified EB app and environment using --staged. If you have a Docker CI project setup with Codeship, you need to define two files: codeship-services.yml and codeship-steps.yml. The first one defines a set of services, at least one of which should be based on your application. Other services we define are a postgres service based on a standard postgres image (our integration test suite requires postgres), a dockercfg service which we use to authenticate against our docker registry (ECR), and finally a deployment docker which we built around our tool described in item 4 in the How section here above. Those of you familiar with docker-compose might be familiar with the directives here, because they are related. In our steps file we have three steps: test, which starts a docker based on the app service with the command make docker_test. Our Makefile has a target which runs the tests with the appropriate configuration for a docker which is linked to another docker named postgres. Our second step is called push docker and it specifies how to tag and push the docker built by our app service. Finally we have a deployment step which runs an instance of our deployment service, with the command required to trigger a deployment. The deployment step specifies tag: master which means it should only execute for our master branch. Personally I wish Codeship would have named this directive branch instead of tag. That would have been more intuitive for our use case, since dockers already have their own tags. The directive however works for git tags as well, so that explains the name. Since the steps are serial, as specified at the top of the document, each step only executes if the previous step was succesful. For our deployments we built a docker around the deployment tool described above, with a helper script as an entrypoint which prepends dpl deploy.